April 18, 2005. For immediate release. Island Gallery owners, Susan Swannack-Nunn and Jack Nunn, have established a non-profit institute, affiliated with the Gallery, whose purpose is to promote the preservation and development of traditional art forms in different cultures and facilitate interaction of artists practicing these art forms. An ongoing effort is assisting batik artisans in small villages in Indonesia with textile and marketing technologies to help sustain the traditional art form of producing hand made batik textiles. The first artistic exchanges will occur this summer, with the help of corporate sponsors including Starbucks Coffee International. 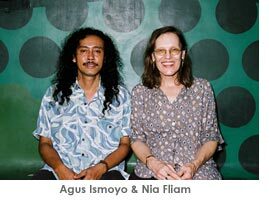 Agus Ismoyo and Nia Fliam, husband-wife team, are internationally recognized batik artists. Their studio is considered one of the leading centers of contemporary fine art batik in Indonesia today and has an international reputation for its innovative work. Susan Pavel, a well-known weaver in Washington, is helping to educate the public about Coast Salish weaving to preserve not only the art form but also the many teachings that are reflected in the work; she has exhibited at the SAM and her work is represented in private collections. 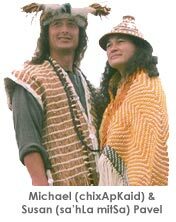 Her husband Michael Pavel is a traditional Salish artist and educator. They live, with their children, on the Skokomish Indian Reservation where they maintain an artist studio. Both couples will work together at the Island School Art Room on Bainbridge Island July 5-12 to produce a collaborative art piece uniting Salish weaving, Indonesian batik and Salish wood carving � reflecting their unique cultural traditions in the contemporary rendition of cultural motifs which carry meanings spanning centuries. The artists will give a public lecture at the Bainbridge Public Library on Sunday, July 10 and the public is invited to observe them working on July 12. Internationally acclaimed batik artists Agus Ismoyo & Nia Fliam, who are exhibiting and lecturing at the World Batik Conference in Boston, will conduct hands-on workshop at the Island School, where students will learn the methods of batik and complete several textiles. To insure a place at this workshop advanced payment is required. Call 206-780-9500.